We are all made up of energy. Light is one form of energy. The physical body is the stepped down energy of light. We are a physical manifestation of gradients of divine light, filtered through a system of interfaces called Chakras by the ancients. A Chakra serves as the interface point between physical aspects of the body & the subtle, non-physical, non-local, Universal Energy Field (UEF). Each Chakra acts as a transducer (a transducer converts energy from one type to another), as well as a transceiver, continually receiving and sending energy between the UEF and us. The system of the Chakras provides a structural blueprint, a conduit for this light energy. The information contained within is stepped down through the matrix of creation into a physical expression of that energy – our corporeal bodies. As such, Chakras are what feed us the parameters for this consensual reality. What our Chakras energetically send back to the UEF passes through and is stored in the Akashic records. All of our experiences and emotions are recorded in the Akash, which serves as a blueprint for our personal growth and that of humanity. Each Chakra functions as a tuned and resonant antenna that translates information into manageable frequencies for our body to utilize. The spin rate is part of the tuning. The frequency of each Chakra’s “spin” determines which portion of the light is meaningful, i.e. each Chakra responds only to the information to which it is tuned. This is the premise behind the assignment of specific attributes and responsibilities for each Chakra, i.e. the Root Chakra focuses on survival issues, the Sacral Chakra on creativity, etc. When, like the radio analogy presented in the article “Oh, No, My Chakras are Closed – is it terminal?” you have a clear channel to the information coming from the Universal Energy Field, the Chakras function at optimal levels. Life is good; you are healthy and are living at your fullest potential. The filters that we develop as a result of our human experience can alter, or distort, the frequency, amplitude and shape of the Chakras. Holding on to emotionally charged memories of fear, guilt, shame, and hate create energetically dense filters, which can adversely impact our two-way communication between the Chakras and the UEF. Imagine that our Chakras act like the system of photoelectric cells in a solar panel. A clear view of the sun’s light produces the maximum voltage output for the panel. A cloud comes along and casts a shadow on the panel, filtering out a portion of the sun’s light. The energy output, which is measured in voltage, decreases. Throw a cover on the panel, and all of the sun’s radiant energy is blocked from the panel; without the sun’s light, the panel cannot produce any energy. When we talk about “clearing” the Chakras, we are describing the condition where all filters, or obstructions are removed, allowing the Chakras to act as efficient energy conduits. These filters can involve long standing emotional issues as well as little annoyances that might crop up on a daily basis. Releasing any emotionally charged negative energies could be effectively accomplished via hypnosis, self-hypnosis, EFT or other energetic modalities. Essentially, we want to “clear” a path for the unobstructed energy flow between our Chakras and the Universal Energy Field. Remember I stated that the Chakras both receive and send energy? Imaging that, if we follow the optimal flow between each Chakra and the UEF, the path traces a figure “8”, the infinity sign. This pattern is repeated in the optimum exchange of energy between each of the Chakras. The ancient Vedic texts describe this movement as two channels – the Ida, the yin, negative, cool, left, and feminine current, and Pingla, the yang, positive, warm, right, and masculine current. Energy constantly flows if no obstructions impede this infinite dance of energy. When we can maintain a steady flow of this life-force energy, or chi, we achieve symmetry between the incoming and outgoing energies, the right and left side of the body, and the yin and the yang. This symmetry is what we refer to as “balance.” When our Chakras are “in balance”, the energy exchange between our systems and the UEF, is stable and constant. In this state of energetic equilibrium, all channels are effectively communicating. We must remember that “balance”, in context of our human energy system, our Chakras, is an on-going, continual process and not a static, end result. Keeping harmony between our Chakras and UEF involves a constant awareness of this energy exchange. Balance is the principle of action and reaction. It is being attuned to the continuous changes in energy, the ebb and flow of our communications with the UEF. To stay “in balance”, we need to tune into the rhythm of life and to keep our mind moving, our body fluid, and our spirit soaring. Consider our physical lifeblood, which provides constant nutrition for all of our organs as well as cleansing and purifying our body. From before the time of our birth until our last breath, our blood constantly circulates throughout our body. A healthy body that maintains a stable, constant level of good health is said to be in a state of homeostasis. When there is a disturbance of homeostasis, the body incurs a condition called homeostatic imbalance. If an infection disturbs our health, throwing our body’s system into a homeostatic imbalance, our blood shows a measurable elevated white blood cell level. The efficiency of our blood is compromised as our body’s immune system shores up its defenses in order to fight off the infection and return the body to homeostasis. When we are “fighting” an infection, we feel “out of balance,” as the circulation of our blood is not performing at peak efficiency. Illness can also arise if the “highways” of our blood’s circulatory system, the arteries and veins, become restricted through plaque build-up. Our lifeblood cannot flow evenly and without constriction. Many health problems arise, such as high blood pressure and it attendant physical challenges. In this situation, the body is “out of balance.” If a large enough piece of the plaque dislodges from the artery wall, an obstruction of the blood may occur in the form of a stroke. Depending on the location of the clot, this condition could cause anything from a localized paralysis to death. Just as we need to keep our blood circulating at peak efficiency for optimal physical health, so we also need to keep the life force energy, chi, circulating between our Chakras and the UEF. When this energy flow is stable and constant, we attain a psychic balance of our energy systems. Clearing a Chakra, then, is the process of removing any blocks so the Chakra can receive and send an uninterrupted energy current between the UEF. Balancing a Chakra involves keeping this exchange of energy moving in an even, steady manner. In the article posted May 11, 2011, Gerry’s Chakras show that they are “open”, i.e. unblocked, as there is a strong flow indicated for each Chakra. The look and size of each Chakra indicates that this energy requires synchronizing, which is what he did using EFT. 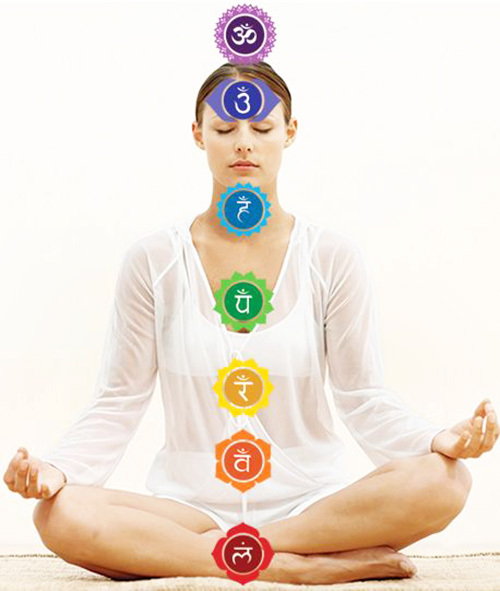 When first working with the Chakra system, I determine, on a Chakra-by-Chakra basis, if any major blocks need clearing. Once this is accomplished, I implement an overall balancing of the Chakras, which connects our energetic system with the optimal flow of chi.